A couple people were asking me recently about what bag I used in India. Baggu, the designers of those great reusable shopping bags that come in tons of pretty colors (the blue and white is my favorite), just came out with two new styles: a duck bag with a cross body strap and a backpack, both in canvas. 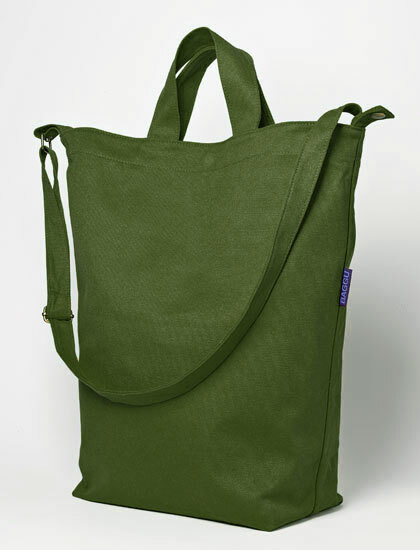 I decided to order the army green duck bag just before we left–and used it the whole time. Pros: it was light-weight, non-leather (important for some temples), and washable; Con: it only has a button-snap closure at top, rather than a zipper. Turned out to be plenty secure and it was a bargain at $20. Plus, I’ve been loving using it as a shopper in New York.